The new Mercedes-Benz E-Class All-Terrain promises versatility and intelligence in a striking outfit that is uniquely Mercedes-Benz and comes with the new 9G-TRONIC nine-speed automatic transmission as standard. From unpaved tracks to rock climbing or steep serpentine roads to a snow-bound ski lodge - the new E-Class All-Terrain takes routes where conventional estates often have to give up effortlessly in its stride thanks to greater ground clearance with large wheels and 4MATIC all-wheel drive as a standard feature. And it also cuts a fine figure thanks to its striking look with powerful flared wheel arches and SUV radiator grille. The E-Class All-Terrain will celebrate its world premiere at the Paris Motor Show 2016. The market launch will follow in the spring of 2017. "No E-Class has ever been as versatile as the All-Terrain. The new model combines a striking look in SUV style with the intelligent space concept of the estate. This is coupled with lots of innovative safety features and the multi-award-winning E-Class interior", says Ola Källenius, Member of the Daimler management board responsible for Sales and Marketing of Mercedes Benz Cars. 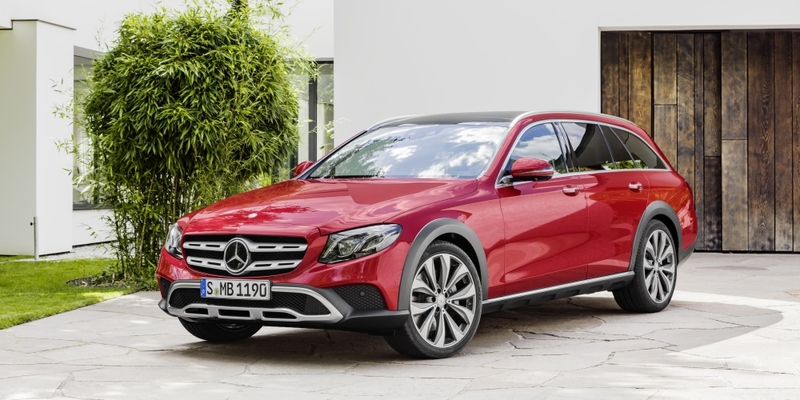 "With 4MATIC all-wheel drive as a standard feature and increased ground clearance thanks to the AIR BODY CONTROL multi-chamber air suspension the All-Terrain is a flexible all-rounder - for unpaved roads, family and leisure time." Thanks to styling elements with an off-road look the All-Terrain has a powerful and robust appearance which also distinguishes it from the classic estate. Dynamism and modern luxury unite with superiority that leaves no doubt as to the status of this model and follow the current design idiom. The All-Terrain is a further ambassador of the Mercedes-Benz design philosophy of the sensuous clarity that defines modern luxury. The most eye-catching feature of the striking front is the SUV-style two-fin grille with a star integrated in the centre. The fins come in iridium silver. The distinctive front bumper and the panelling in underride guard-look, electroplated in silver-chrome, also contribute to the robust appearance. The top part of the three-part front bumper is painted in the body colour and the lower part comes in grained black plastic. In the side view the black wheel arch covers are a distinctive feature that emphasise the all-terrain character. This also applies to the side skirt that comes in the same colour and features a chrome trip strip. Three exclusive light-alloy wheel sets in 19- and 20-inch format with higher sidewalls give the vehicle a confident look, more ground clearance and enhanced comfort on rough roads. The All-Terrain also features a model-specific three-part bumper at the rear with the top part painted in the body colour and the lower part in grained black plastic. Further features typical of an SUV include robust outer load sill protection and a visual underride guard electroplated in silver-chrome. The special features of the interior include a trim part in aluminium-carbon look exclusive to the All-Terrain, stainless steel sports pedals with rubber studs and floor mats with All-Terrain lettering. The equipment of the All-Terrain is based on the AVANTGARDE interior line, EXCLUSIVE and designo appointments are optionally available. The new model boasts all the intelligent load compartment solutions of the E-Class estate such as the rear seat cargo position and folding with a 40:20:40 split as a standard feature. All E-Class innovations relating to safety, comfort and convenience are available.